Since Purchase.ie was founded by in 2009 we have always tried to support Irish products where possible which can enable our customers to reduce bills and save money. 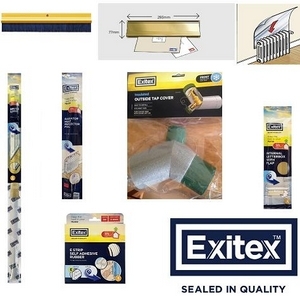 We now have over 50 products listed in the dedicated Irish Product section on our website and are glad to announce that we have added a wide variety of energy saving products from the Dundalk based company Exitex. The Exitex range largely focuses on insulation, heat retention and draught exclusion and can help you go a long way towards reducing your energy bills and saving money. With prices from just €3.95 the Exitex range will provide you with a very quick return on investment for a very small outlay. As 75% of the money spent online by Irish consumers leaves the country every year we hope that consumers will start to give some thought to buying Irish online. Ordering some of the Exitex range from Purchase.ie is an opportunity for you to make a real difference by supporting both an Irish manufacturer and an Irish online store and in turn helping to boost the local economy. If Irish online consumers spent just 1% less with companies not based Ireland it would result in a boost of our 40 million euro to the local economy in 2014.